There were days when, if you had a car, you could wander the streets safely. Traffic jams did not exist, and there were less rules and, of course, less cars. Environmental issues were just starting to make surface, there was enough fuel for everybody and car makers and customers didn't worry about fuel consumption. In these golden days, you needed some serious mechanic skills if you wanted to drive your car around the country. There were no companies to call in the middle of the night if your car broke down on an unknown country road. The cars that you used to see during those days are now considered antiques. But these classic cars will always remain in our memory, not only for their beautiful design and sometimes outrageous performances, but also for the way of life and decades they stood for. Puzzle Warehouse brings you, classic cars amateur, Classic cars Jigsaw Puzzles. Among the many puzzles that fit into the category, you will be pleased to learn about the Classic Corvette Mosaic, a large Corvette made out of thousands of tiny Corvette photographs. 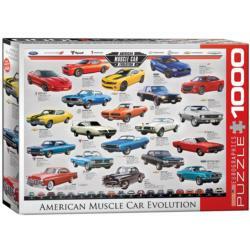 And if you don't like the Corvette, there's nothing better than a classic Mustang, like the one in the Classics-Top Prize jigsaw puzzle. And that's not everything Puzzle Warehouse has to offer to those who love classic cars. A lot more beautiful jigsaw puzzles depicting classic cars and scenes featuring classic cars are waiting to be discovered at the online store, for some, of course, classic prices.